Description of "Advanced Valuation for Secured Lending by Banks and Financial Institutions"
Market value serves as the safety valve to the secured lending dynamics of landed property. This book highlights the concept of market value and the various approaches by which it can be estimated. The parallel occurrences of other types of values are presented through the reproduction from the International Valuation Standards' definitions and concepts. The role of comparative evidence in valuation and the concept of hierarchy of evidence in valuation have been presented with reference to the relevant RICS literature on these aspects. All these basics are the subject matter of the first chapter of this book. The second chapter gives a general overview of the secured lending applications. The onward chapters—the owner-occupied property, the development property, the investment property and the trade-related property focus on the corresponding areas through examples of problems typical in valuation. Thus the chapter on owner-occupied property deals with often-faced problems in the valuation of new and old flats under owner occupation. The chapter on development property gives a detailed exercise for secured lending valuations of properties for development with the presentation of discounted cash flow techniques. The chapter on investment property gives the pros and cons of income-producing properties from various aspects including presentation of the concept of equated yield. The chapter on trade-related property gives an overview of valuation of property used as a part of the trading process. This chapter also encompasses an example of valuation of a hotel and another of valuation of a nursing home. A chapter on the mathematics of valuation tables has been presented with examples of formation and application of the valuation tables. The last chapter deals with how the valuer should act under the various circumstances of a secured lending valuation. This chapter also reproduces extracts from RICS literature dealing with the minimum contents of a valuation report. Syamales Datta received his honours degree in physics from the University of Calcutta in 1963. He went on to pass the Professional Associate of the Royal Institution of Chartered Surveyors (ARICS) exams in 1971 while serving the Howrah Improvement Trust (HIT) as a Deputy Assistant Valuer. A series of promotions followed and in 1993 he was made the Chief Valuer of HIT, a post he held memorably up to his retirement from service in the spring of 2004. Datta is also life fellow of the Institution of Surveyors and the Institution of Valuers, both headquartered in New Delhi. In the year 1993, Datta's first volume, Valuation of Real Property: Principles and Practice was published by Eastern Law House, Calcutta. The book became a hit among practising valuers and in 2004 a second edition was brought out. That book is a prescribed text for the Master of Valuation programme taught at the Institute of Science & Technology for Advanced Studies & Research (ISTAR), affiliated to the Sardar Patel University in Gujrat, inter alia, and is also sold on Amazon.com. Datta's contributions to periodicals and research are much sought after at valuation seminars and workshops. Syamales Datta has taught valuation at the B.E. College (BESU) at Shibpur, Howrah and has also trained up departmental officials of the WB Valuation Board and the Life Insurance Corporation of India. Datta has also been a visiting professor and research supervisor at Annamalai University for their M.Sc. programme. He has taught valuation at HUDCO, Institute of Urban Management (IUM), Institute of Engineering and Management (IEM), Institute of Local Government and Urban Studies (ILGUS) and Jadavpur University. The practising valuer will find his books useful if not indispensable and will, after reading them, be able to solve problems more creatively and far beyond the limits of what they directly impart, with self-confidence! 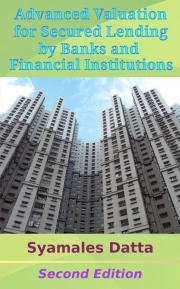 Reviews of "Advanced Valuation for Secured Lending by Banks and Financial Institutions"